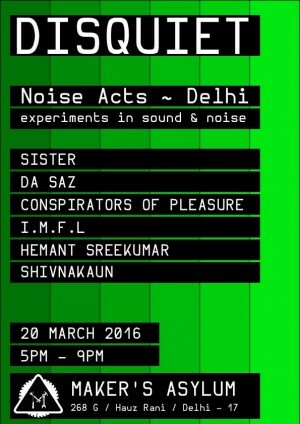 Disquiet are a series of random live events in New Delhi featuring experimental acoustics exploring Glitch, Drone, Dub, Harsh Noise, Ambient, Signal-test, Word & various other obscure Avant Garde audio performance styles. With a casual lineup at each instance – this series of happenings allow performers to self indulge and produce performances that explore the thresholds of sonic perception. Attend only if you need to get your ears cleaned or get your brains washed. Thanks to Hemant Sreekumar at Disquiet.